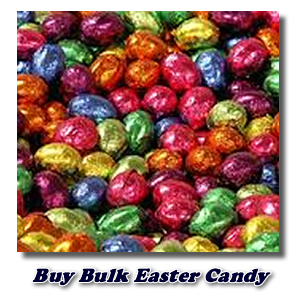 Buying bulk Easter candy is a great way to save money on your Easter candy gift giving, especially if you have a lot of people to treat. You don't have to spend a fortune, but you can still get high quality bulk Easter chocolate candy. Have a look at what is on offer from some of my favorite candy sellers below. Even if you're not quite sure what you want, you'll get some great ideas by browsing through this selection. From Easter bunnies to bulk Jelly Belly beans you'll find a range of items from which to choose. Believe it or not, they even have edible Easter grass! If you are looking for something a little less gourmet (and a little less pricey) that's not a problem either. You'll find chocolate Easter candy in a variety of price ranges. My mother-in-law was a supervisor at a title company before she retired. She always bought a little something each holiday for those in her department. It was a kind gesture that all the staff appreciated. No matter who you decide to treat, wholesale Easter candy may be just right for you. I hope you find exactly what you are looking for and that you and yours have a wonderfully Happy Easter. Don't forget to remember the wonderful gift we were given on this special day, forgiveness of sins through the death, burial, and resurrection of the Lord Jesus Christ! So, who do you give special Easter chocolates to each year? I'd love to hear from you with your gift giving ideas. Do you make up little gift bags or baskets? Maybe you've got your own unique design that you've created. We'd love to see it. Tell us the story of some creation you made for a group of special people in your life. We'd love to have step-by-step instructions along with photos if you have any. I'd be so pleased to feature your idea here on the site so that others can see your clever work and perhaps use it themselves to spoil someone they know. Go ahead and use the form below and I'll take it from there! Happy Easter! Have An Easter Party Idea To Share? Do you have a great Easter candy recipe or Easter party idea that you've seen somewhere or come up with yourself? Don't be stingy, share it with the rest of us! Your Easter idea will appear on a Web page exactly the way you enter it here. You can wrap a word in square brackets to make it appear bold. For example [my story] would show as my story on the Web page containing your story. Do you have a picture of your Easter idea to add? Great! Click the button and find it on your computer. Then select it.